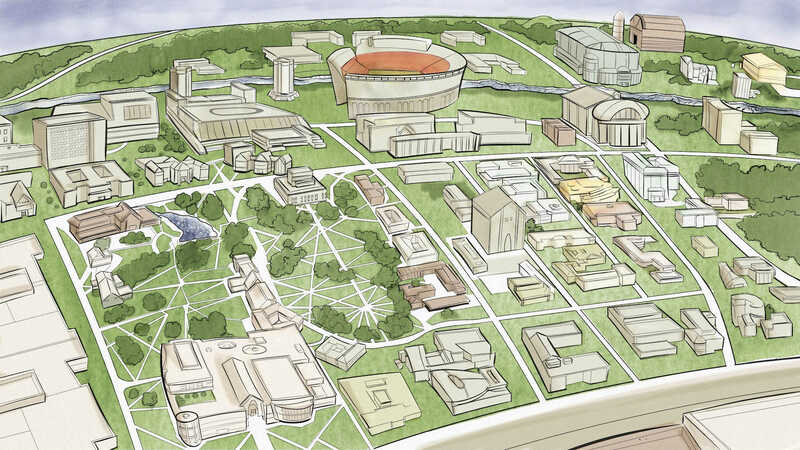 Explore the ever-changing face of The Ohio State University campus. 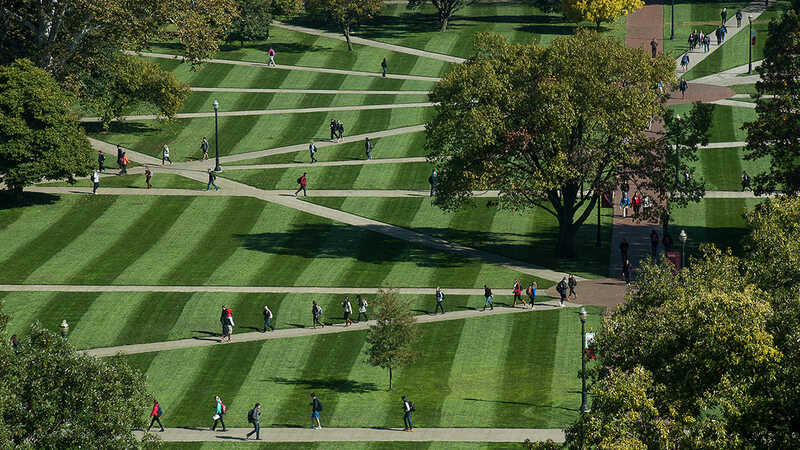 An evolving landscape that enriches lives, Ohio State’s Columbus campus is where intellectual horizons expand. Where desire and determination intersect. Where discoveries in the lab are applied at the hospital bedside. The environment inspires and empowers those on a journey of exploration. Coffee shops, theaters, museums and vibrant neighborhoods are only a short walk away. Learning is an active endeavor, and thoughtful design fuels collaboration. Today’s residence halls reflect the ways students want to live, study and get involved. More than just a pretty place, our river, farmland and trees are laboratories for learning. With its collection of small, bustling neighborhoods bubbling with promise, we celebrate the city-like qualities of our university landscape. Nathan Grine jokes that his hometown in northwest Ohio doesn’t even have a stoplight. Involvement through his high school’s 4-H program brought him to Columbus, and he began to see the benefits of a Big Ten experience in a big city. Nathan is active with his scholars’ community, Residence Life and community service organizations. What once seemed big now seems as familiar as his small hometown. Slide 1: Nearly 60,000 students are enrolled at Ohio State’s Columbus campus. Its 1,600 acres feature everything from agricultural fields to an arts district, giving students a Big Ten experience in the country’s 15th-largest city. Slide 2: The Oval, a park-like environment in the center of campus, has been home to graduation ceremonies, student involvement fairs, political rallies, romantic walks and the revelry of countless beautiful spring days. The Oval has been a critical component of the student experience since 1873. Slide 3: Hayes Hall, pictured here in 1975, is the oldest building on campus and representative of Romanesque architecture. Ohio State’s Columbus campus does not feature one architectural style. Instead, says University Architect Bernie Costantino, contemporary styles are embraced, and consistency is achieved through the usage of similar building materials, such as red brick and limestone. Slide 5: The Recreation and Physical Activity Center is where Buckeyes go for health, wellness and friendly pickup games of basketball. The RPAC has more than 27,000 square feet of fitness space hosting state-of-the-art equipment, aquatics facilities and heart-pumping classes. Nearly 60,000 students are enrolled at Ohio State’s Columbus campus. Its 1,600 acres feature everything from agricultural fields to an arts district, giving students a Big Ten experience in the country’s 15th-largest city. The Oval, a park-like environment in the center of campus, has been home to graduation ceremonies, student involvement fairs, political rallies, romantic walks and the revelry of countless beautiful spring days. The Oval has been a critical component of the student experience since 1873. 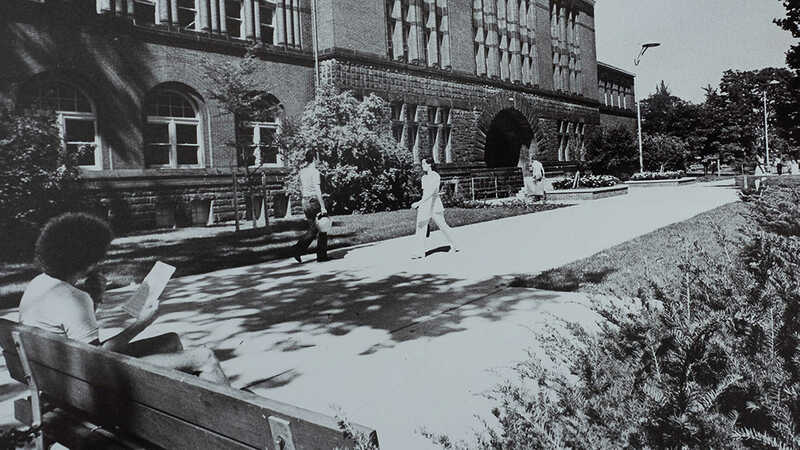 Hayes Hall, pictured here in 1975, is the oldest building on campus and representative of Romanesque architecture. Ohio State’s Columbus campus does not feature one architectural style. Instead, says University Architect Bernie Costantino, contemporary styles are embraced, and consistency is achieved through the usage of similar building materials, such as red brick and limestone. 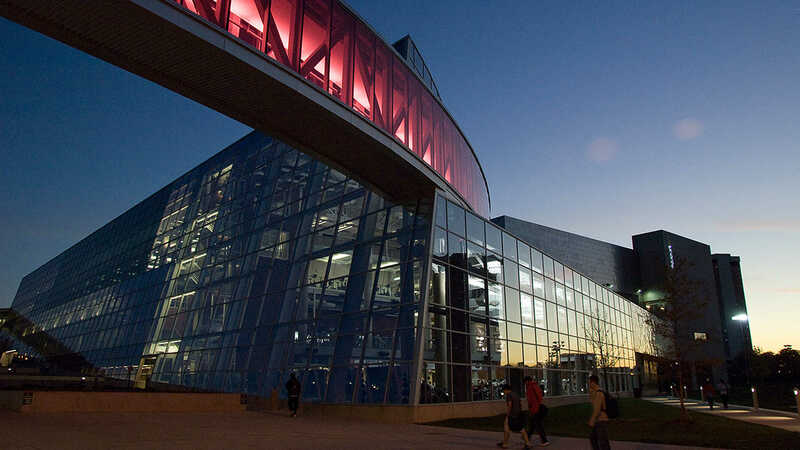 The Recreation and Physical Activity Center is where Buckeyes go for health, wellness and friendly pickup games of basketball. The RPAC has more than 27,000 square feet of fitness space hosting state-of-the-art equipment, aquatics facilities and heart-pumping classes. Today’s learning environments demand modern facilities, advanced technology and areas for collective work. 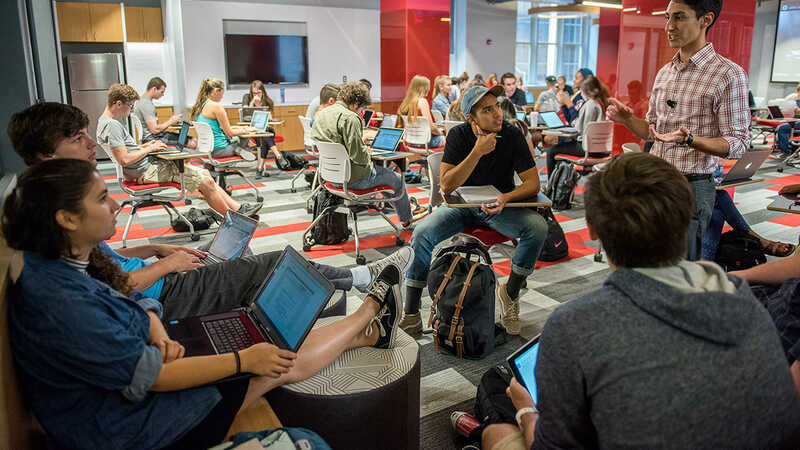 Ohio State intentionally designs spaces to promote collaboration on campus — and with our neighbors. The STEAM Factory, an inviting, bohemian space with views of the Columbus skyline, has hosted 2,000-plus hours of faculty interaction to facilitate interdisciplinary work and find opportunities to connect with industries and communities around Columbus. It’s where Kathy Malone and Zakee Sabree bonded over stink bugs. Malone, an assistant professor from the College of Education and Human Ecology, was giving a one-minute presentation about revolutionizing the way science and math are taught to middle and high school students. Lesson plans included the brown marmorated stink bug. A few months later, the two were working together and with area teachers to develop a modeling-based biology curriculum for students in grades 7-12. The new teaching approach is being implemented in 32 classrooms across central Ohio now. 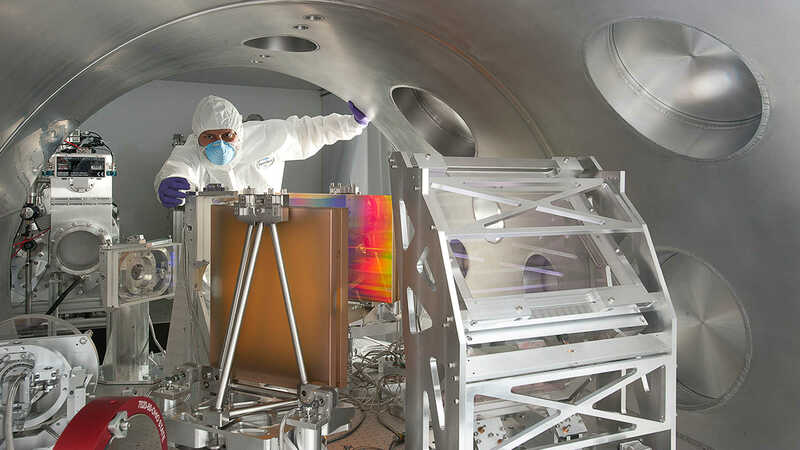 Students are achieving greater success in science all because of a space specifically designed for connecting disparate disciplines. That, and stink bugs. Slide 1: Atria of glass and skylights make the stack tower at Thompson Library a beautiful backdrop for students poring over books. Constructed in 1951 to meet the needs of rapid enrollment increases after World War II, the tower is a focal point visible from every corner of campus — a north star embodying the university’s educational mission. Slide 2: The Chemical and Biomolecular Engineering and Chemistry building opened in 2015 and is designed to encourage interdisciplinary work and research among scientists, engineers, postdoctoral fellows and graduate and undergraduate students. State-of-the-art equipment is housed in flexible laboratory space. Students refer to it as their home away from home, where they can focus on the rigors of their studies in lounges that offer panoramic views of campus or find friends to join in a quick game of Euchre. Slide 4: Students work in a drafting room of Hayes Hall in 1895. The building was constructed in 1873 for the industrial arts and named after President Rutherford B. Hayes, former member of The Ohio State University Board of Trustees and advocate for industrial education on campus. Today, Hayes Hall is home to Ohio State’s Department of Design. Slide 5: Ziv Bell, psychology graduate teaching associate, instructs students in the Innovative Space in Campbell Hall in 2016. 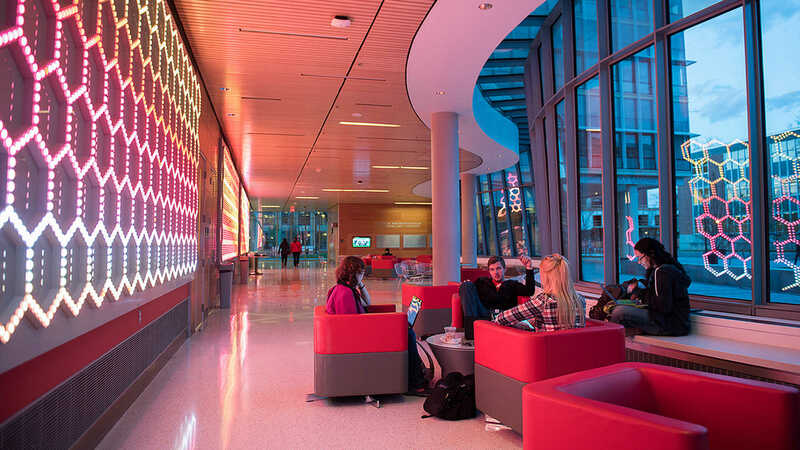 Open, collaborative spaces like this one are sprinkled across the Columbus campus. 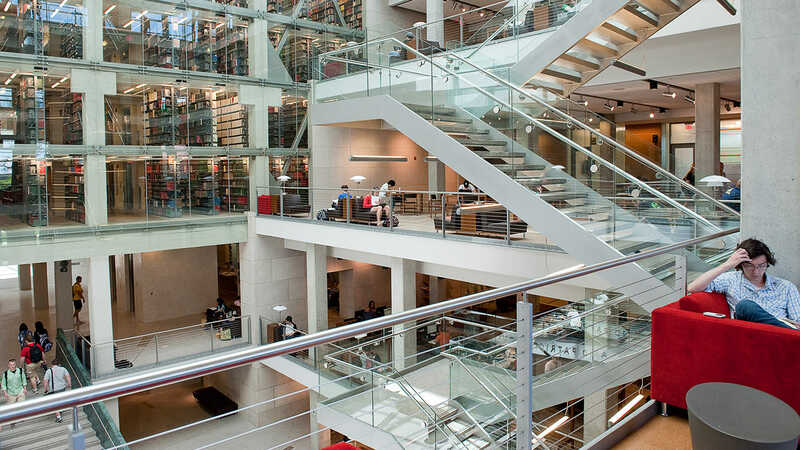 Atria of glass and skylights make the stack tower at Thompson Library a beautiful backdrop for students poring over books. Constructed in 1951 to meet the needs of rapid enrollment increases after World War II, the tower is a focal point visible from every corner of campus — a north star embodying the university’s educational mission. 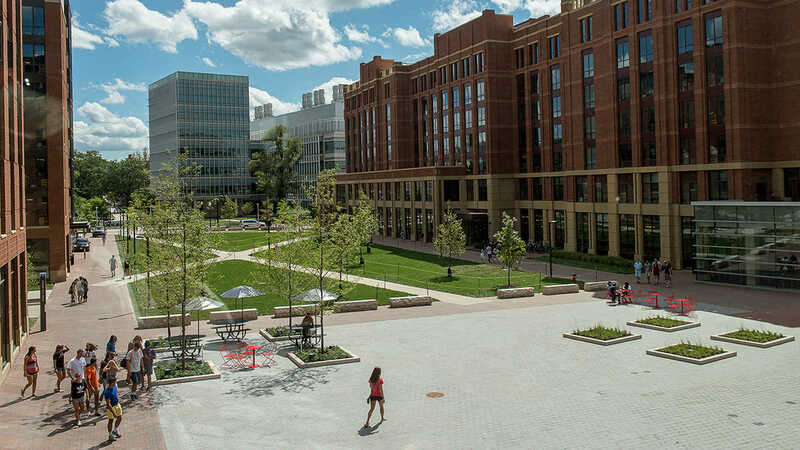 The Chemical and Biomolecular Engineering and Chemistry building opened in 2015 and is designed to encourage interdisciplinary work and research among scientists, engineers, postdoctoral fellows and graduate and undergraduate students. State-of-the-art equipment is housed in flexible laboratory space. 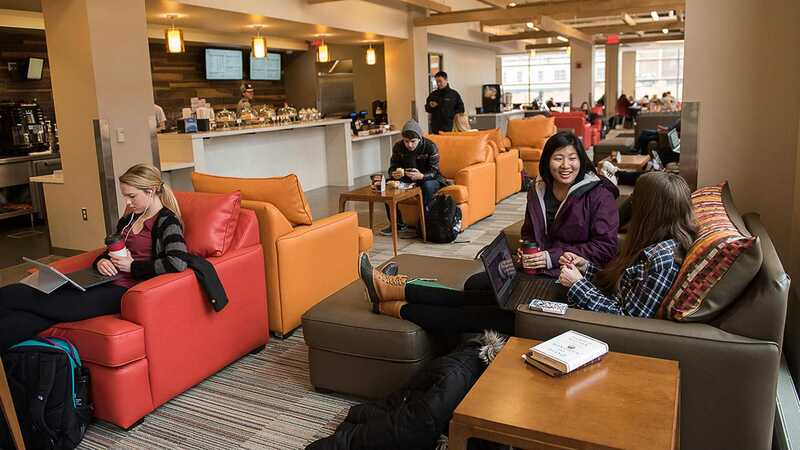 Students refer to it as their home away from home, where they can focus on the rigors of their studies in lounges that offer panoramic views of campus or find friends to join in a quick game of Euchre. 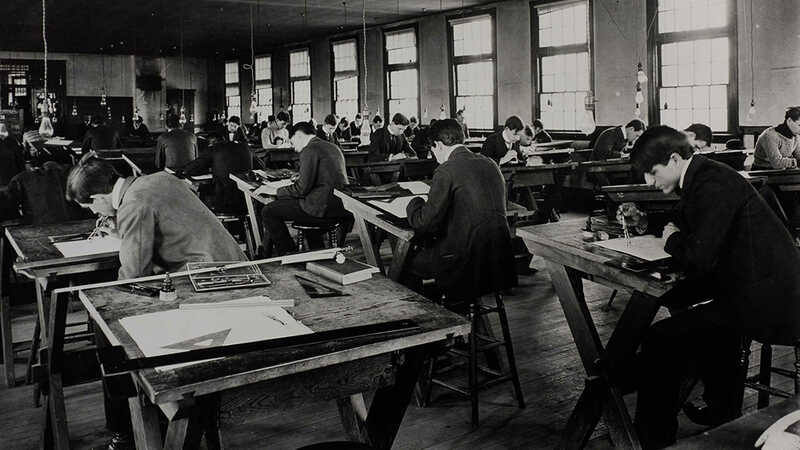 Students work in a drafting room of Hayes Hall in 1895. The building was constructed in 1873 for the industrial arts and named after President Rutherford B. Hayes, former member of The Ohio State University Board of Trustees and advocate for industrial education on campus. Today, Hayes Hall is home to Ohio State’s Department of Design. Ziv Bell, psychology graduate teaching associate, instructs students in the Innovative Space in Campbell Hall in 2016. Open, collaborative spaces like this one are sprinkled across the Columbus campus. 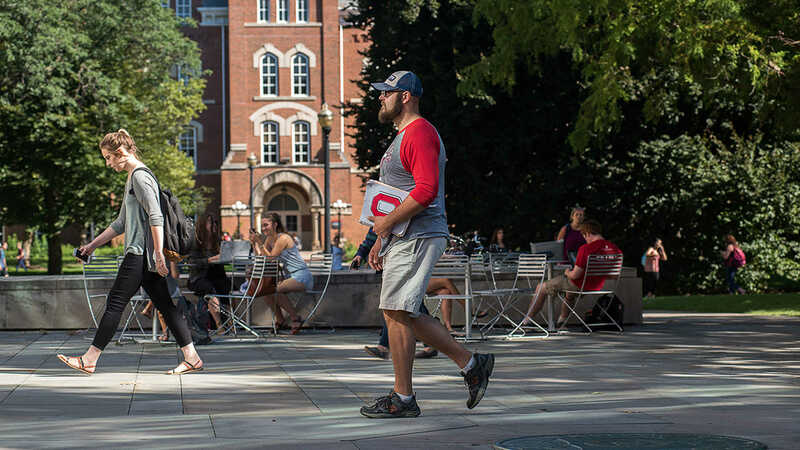 Interpersonal connection is critical for student success, and Ohio State supports that at every turn. Nursing is a competitive major. So during her first semester as a Buckeye, Victoria Murphy took advantage of additional support available through her learning community in Park-Stradley Hall. As a member of the Nursing and Wellness Innovations Learning Community, she had dinner with the dean of the College of Nursing, attended a session about the importance of diversity in public health and found study partners tackling the same rigorous courses as she. That kind of teamwork and access to faculty are found in learning communities across campus and within the Second-year Transformational Experience Program. STEP has influenced the design of the North Residential District itself to improve student success and graduation rates. Sushmitha Ravikumar lives in Torres House with other engineering and chemical engineering majors. She sees students with similar interests connect with each other and mentors in their fields of study. These are the networks that will support them throughout their education and their careers. Slide 1: Connecting Grounds is a popular hangout for students in the North Residential District of campus that serves direct trade coffee. Its cozy couches and chairs are perfect for studying or meeting with faculty and mentors. Slide 2: First-year students in the SUSTAINS Learning Community in Scott House canoe down the Olentangy River in 2015. Professors Rick Livingston and Piers Turner organized the trip to increase students’ awareness about local waterways and deepen their interest in the environment around them during their time as students at Ohio State. Slide 3: Students play volleyball in their bare feet on south campus in this undated photo. As the university experienced surges in enrollment following World War II and with baby boomers reaching college-age, planners focused on how to accommodate more students on campus while maintaining smaller communities catering to individual needs. Slide 4: A space to sleep, study and display mementos and photos, there is a lot of living to do in a residence hall. Ohio State found students had greater success academically and socially by living on campus the first two years, which led to the creation of the Second-year Transformational Experience Program (STEP). Connecting Grounds is a popular hangout for students in the North Residential District of campus that serves direct trade coffee. Its cozy couches and chairs are perfect for studying or meeting with faculty and mentors. 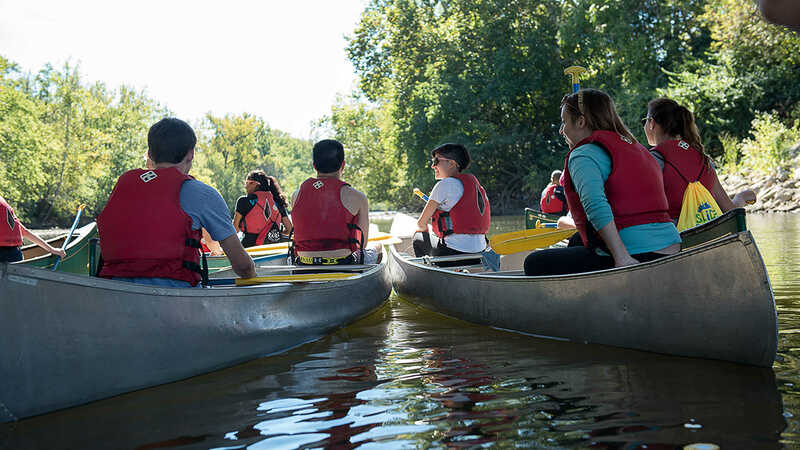 First-year students in the SUSTAINS Learning Community in Scott House canoe down the Olentangy River in 2015. Professors Rick Livingston and Piers Turner organized the trip to increase students’ awareness about local waterways and deepen their interest in the environment around them during their time as students at Ohio State. 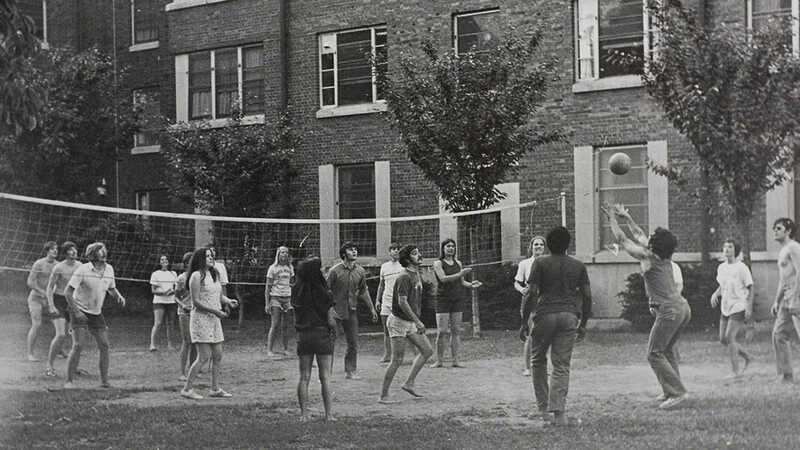 Students play volleyball in their bare feet on South Campus in this undated photo. As the university experienced surges in enrollment following World War II and with baby boomers reaching college-age, planners focused on how to accommodate more students on campus while maintaining smaller communities catering to individual needs. A space to sleep, study and display mementos and photos, there is a lot of living to do in a residence hall. Ohio State found students had greater success academically and socially by living on campus the first two years, which led to the creation of the Second-year Transformational Experience Program (STEP). With its running river, canopies of trees and rolling farmland, our campus learning environment extends beyond brick and mortar. Standing in the middle of Waterman Agricultural and Natural Resources Laboratory, Dr. Terry Niblack looks past the crops and dairy cows and points to the buildings on central campus. Not only is it rare to have a 261-acre working farm so close to campus, she adds, but it’s unique because this space provides an active learning area for students from a variety of disciplines, including environmental science, engineering and veterinary medicine. 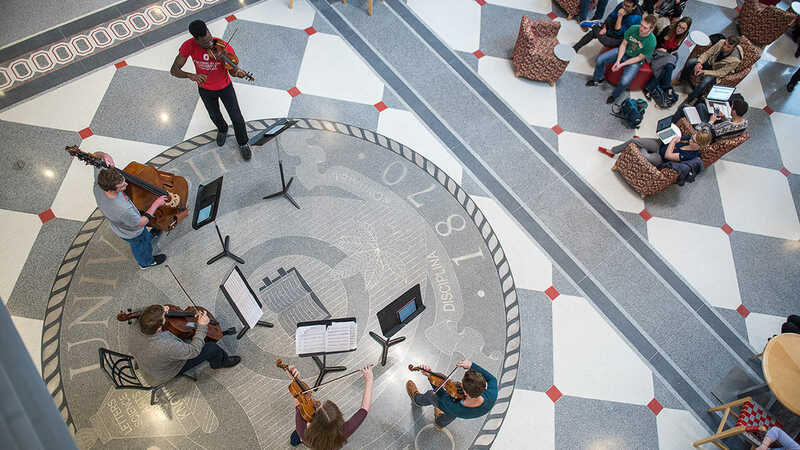 It’s not the only place on campus where students and researchers can learn by doing. 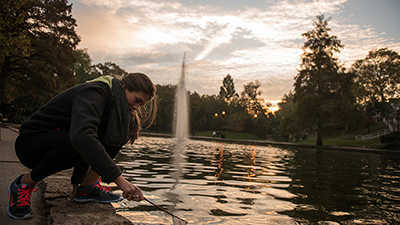 From studying plant life at Chadwick Arboretum and Learning Gardens to investigating the ecosystems that make up the Olentangy River, these iconic campus images provide hands-on learning opportunities while just steps away from an urban campus setting. 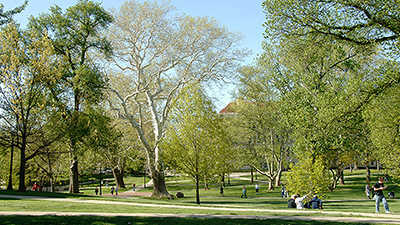 One of the most iconic images of Ohio State, Mirror Lake began as a natural bog that had formed around a large spring. Campus historians said it was this spring that helped determine where to build the university. “There can be no doubt that the availability of an adequate supply of good drinking water would have been a major consideration,” says former campus planner John Herrick. In 1874, workers cleaned out the bog, and pools of water formed, eventually developing into Mirror Lake. There’s an effort under way now to restore the lake to a more natural state. With new features like wetland marshes, it also will provide hands-on research opportunities for students and faculty. The planting of trees and shrubbery has been a focus of campus planners since the late 19th century. An article from 1930 boasts that the campus had 1,740 trees at that time. Today, that number is closer to 16,000. 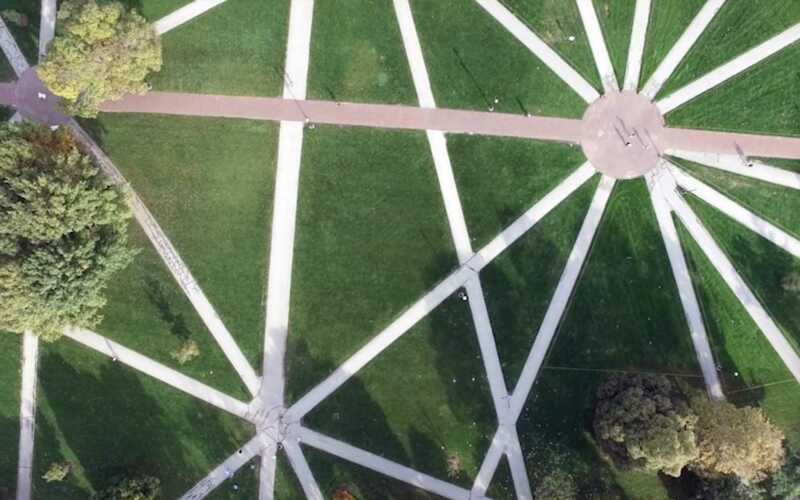 For six years in a row, Ohio State has been honored with the Tree Campus USA certification, which honors the university’s commitment to protecting its tree canopy. Additionally, the Chadwick Arboretum and Learning Gardens was established in 1980 and now includes 60 acres of gardens, trees, a solar house, a lake and other features that all provide hands-on learning and research opportunities. “What we’re trying to do is not think of sustainability as a separate thing, but how it can be integrated into all things,” says Kate Bartter, director of the university’s Office of Energy and Environment. The university is committed to a list of sustainability goals, which includes reducing building energy consumption 25 percent by 2025. Bartter says that students have opportunities to get involved with research on topics like solar energy and sustainable transportation. “These are experiences that I don’t know they could get any other place,” she says. 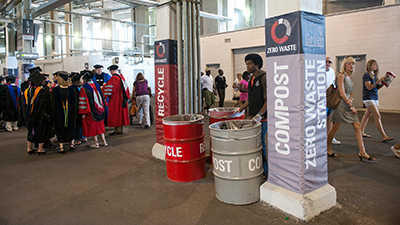 Additionally, Ohio Stadium is the largest stadium in the country to continuously achieve Zero Waste, which is diverting at least 90 percent of all waste into recycling or compost. The Olentangy River has been both a focal point for development and an active learning space. Development along the river picked up in the 1960s and 1970s with the opening of new residence halls along the river. In 2012, a dam was removed to help bring the river back to a more natural state, with an improved ecosystem and more wetlands. 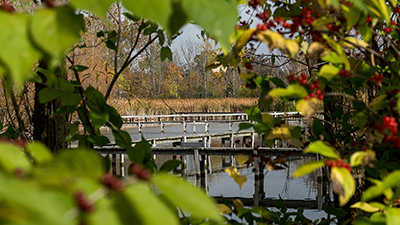 Just north of campus is the Olentangy River Wetland Research Park, a 52-acre site that provides hands-on opportunities for students to study topics like ecosystems and conservation. “There’s the class part, but then we get to go outside and have that living lab right there,” says Mazeika Sullivan, park director and associate professor in the School of Environment and Natural Resources. Waterman Farm is one of Ohio State’s most unique sites, composed of 261 acres of farmland in the middle of an urban environment. Described as a “working outdoor laboratory,” the farm provides hands-on experience and research opportunities for students from a variety of disciplines, including animal science, art, engineering and more. “Having something like the Waterman Agricultural and Natural Resources Laboratory available is very rare,” says Dr. Terry Niblack, interim senior associate dean in the College of Food, Agricultural and Environmental Sciences. 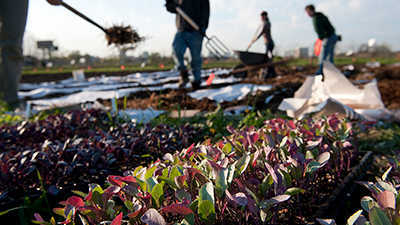 Students help run the farm, which includes a variety of crops as well as dairy cows. Whether you’re a future Buckeye or a long-time alumnus, there’s no better way to experience the Ohio State campus than to come and explore for yourself.